Family February has arrived at The Real Mary King’s Close and to mark the occasion, we are introducing our first ever family ticket, offering a saving of seven pounds per family. Launching in time for half term, the ticket which is based on admitting two adults and two children (aged 5-15 years), comes in direct response to the growing number of family visitors that we have welcomed over the last twelve months. 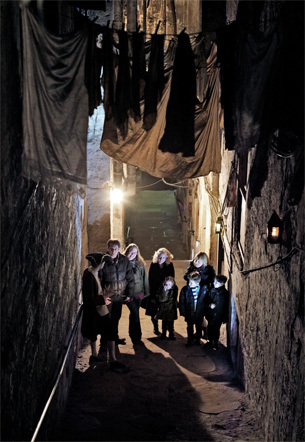 Despite often associated with being spooky, it is the attraction’s ability to bring to life the story of those people who once lived, worked and died in the underground closes between the 16th and 18th century, that continues to appeal to adults and younger visitors alike. The combination of the character tour guide and the unique history of the site, make it a fun yet informative way for families to learn about Edinburgh’s fascinating history. The site has caught the imagination of many visitors over the years and has inspired books that span the whole family including Ian Rankin’s adult fiction Mortal Causes and Philip Caveney’s teenage fiction, Crow Boy, both of which are available to buy in the attraction’s shop. The family ticket will be available any day from 10am until 5pm throughout the entire month of February and if successful, is likely to return for the October school break later in the year. *Due to the nature of the site, this tour is not suitable for children under 5years. A child refers to those aged between 5-15years. Family tickets cost £33.80 and advance booking can be made by calling 0845 070 6244 or in person at The Real Mary King’s Close.